For reasons which frankly elude me this blog seems to have more readers than it did a year ago, and since it’s my mission in life to make sure that everyone sees this wonderful movie, I am reposting this review, with some minor revisions. You could stage a version of Charles Dickens’ “A Christmas Carol” with sock puppets and I would probably watch it. Ever since I was a child, this has been one of my favorite stories. Perhaps it’s the idea that there is good in everyone, and therefore no one is beyond redemption, that appeals to me, but for whatever reason I never miss an opportunity to watch one of the many screen adaptations of this timeless classic when they’re on TV as they inevitably are this time of year. The International Movie Database (IMDB.com, and one of my favorite sites, by the way) lists no less than 25 different versions of “A Christmas Carol“, and while I can’t claim to have seen them all, I’ve certainly seen quite a few. I have watched Alistair Sim, Reginald Owen, Patrick Stewart, Mr. Magoo, and even Rowan Atkinson (as Ebenezer Blackadder in one of the stranger twists on this story) all bring credit to the role of Ebenezer Scrooge. But my favorite version of all time is the one made in 1984 featuring the incomparable George C. Scott as Scrooge. This will probably be on sometime this month, but if you miss it, you owe it to yourself to buy or rent this DVD. This is, in my opinion, simply the very best version of this story ever filmed. 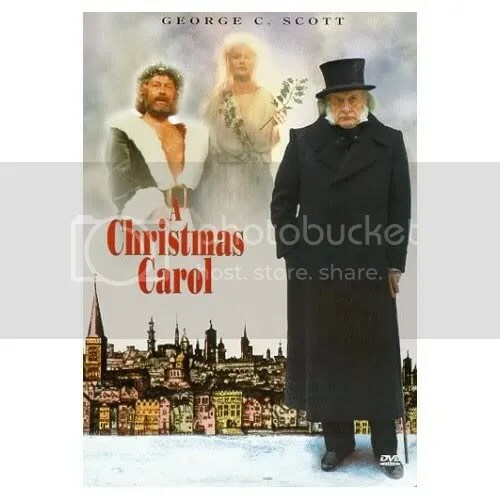 It is a dark version, to be sure, but the incomparable acting, not only from Scott but from the supporting cast, make this a version you simply have to see, no matter how many times you’ve seen other versions of “A Christmas Carol”. What makes this version really stand out is the somber gravitas that the entire cast bring to their respective roles. Lines we’ve heard dozens of times in the past take on a whole new intensity, and each character becomes more real and believable in the hands of this wonderful ensemble. George C. Scott was nominated for an Emmy in 1985 for this role. It is to his everlasting credit that rather than sleepwalking through this oft-portrayed role of Scrooge, he instead gave it a fresh interpretation that was, in my opinion, one of his finest performances ever. He wisely did not attempt a British accent, instead delivering his lines in that famous gravelly voice. His Scrooge is not merely a cranky old man (as he is so often portrayed), but rather a man who harbors a profound rage against the world. As he is visited in turn by each of the Three Spirits, we understand how this rage took root, grew, and ultimately strangled his soul. As he is forced to review his life, we see him alternately softening, and then relapsing again into unrepentant obstinacy. And in the great dramatic scene when he, kneeling and weeping at his own grave, begs for mercy as he attempts to convince the third spirit of his repentance and desire to alter his life, we see a man who has been utterly broken and brought to his knees literally and figuratively. Scott has made Scrooge utterly believable and painfully human. Impressive as Scott’s performance is, the ensemble of supporting actors contributes significantly the this version’s dark beauty. Fred Holywell, Scrooge’s nephew, is an excellent example of this. Often portrayed as an affable buffoon, here he is played by Roger Rees with an emotional intensity missing from earlier portrayals. When he implores Scrooge, “I ask nothing of you. I want nothing from you. Why can’t we be friends?”, we see in his face not only his frustration, but his pain at Scrooge’s self-imposed separation from his only living relative. It is a moving performance, and one of the movie’s most dramatic scenes. In this version, it is perhaps the most riveting scene in the whole movie. Marley’s entrance, as the locks on Scrooge’s door fly open of their own accord and the sound of chains rattling echo throughout the house, is wonderfully creepy. But Finlay’s Marley is no ethereal spirit. He is a tortured, despairing soul, inspiring both horror and pity. Marley may be a ghost, but his rage and regret over a life wasted on the pursuit of wealth, and his despair at his realization that his sins are now beyond redress, are still very human. As portrayed by Finlay, we have no problem believing that even the flinty Scrooge would be shaken by this nightmarish apparition. Finlay really steals the scene here, no mean feat when you’re sharing the screen with George C. Scott. And so it continues, as one remarkable performance after another makes it seem like you’re experiencing this story for the first time. Edward Woodward (remember him from “The Equalizer”?) is by turns both jovial and menacing as the Ghost of Christmas Present. When he delivers the famous line, “it may well be that in the sight of Heaven you are more worthless and less fit to live than millions like this poor man’s child” he is no longer a jolly Santa Claus surrogate, but has become an avenging angel who gives Scrooge a much needed verbal spanking. Susannah York is a wonderfully tart tongued Mrs. Cratchit, and David Warner brings marvelous depth to the long suffering Bob Cratchit, a man who goes through life bearing the triple crosses of poverty, a sick child, and an insufferable boss. His face alternately shows his cheerful courage, and also, at times, his weariness, in the face of intolerable circumstances. Later, in the scene in which Scrooge is shown by the Ghost of Christmas Yet to Come the Cratchit family after the death of Tiny Tim, Warner’s performance will move you to tears. One final note should be made about the musical device used in this movie to unite certain themes. Composer Nicolas Bicat uses a variation of the Wagnerian “leitmotif”, whereby a musical theme becomes associated with a certain character. Here Bicat uses two themes to unite groups of characters. The first, a plaintive theme consisting of two falling phrases, is first heard when Jacob Marley enters Scrooge’s room. This is particularly effective, for instead of the “scary” music one might expect to hear at the entrance of a ghost, what we hear instead is a sad, lonely theme played by a single cello. This unexpectedly tender music underscores the utter tragedy of Marley’s condition. This theme appears several times in the movie during scenes when Scrooge is forced to reflect on his life, uniting him with Marley, and undergoes a dramatic transformation at Scrooge’s graveside scene, where it becomes powerful and dramatic as it is blasted out by a full orchestra. Finally, in the scene where Scrooge “awakens” from his visit from the third spirit, this theme appears in an altered form, coming full circle as it is again played by the solo cello. Now it somehow sounds hopeful, and just as the theme has changed, we realize that Scrooge, too, has changed. The other leitmotif is heard whenever Fred, or his mother Fan, Scrooge’s dead sister, are in the scene. It is a gently skipping theme which, while seemingly happy on the surface, still has a streak of sadness in it. We hear it in the background as Scrooge reminisces about his late sister, or muses over how much like her Fred looks. By uniting these characters it helps make Scrooge more human. In case you haven’t figured it out by now, I love this movie, and make it a point to watch the DVD several times during the month of December. It is my sincere hope that you will, too. You could stage a version of Charles Dickens’ “A Christmas Carol” with sock puppets and I’ll probably watch it. Ever since I was a child, this has been one of my favorite stories. Maybe it’s the idea that there is good in everyone, and therefore no one is beyond redemption, that appeals to me, but for whatever reason I never miss an opportunity to watch one of the many screen adaptations of this timeless classic when they’re on TV as they inevitably are this time of year. The International Movie Database (IMDB.com, and one of my favorite sites, by the way) lists no less than 25 different versions of “A Christmas Carol“, and while I can’t claim to have seen them all, I’ve certainly seen quite a few. I have watched Alistair Sim, Reginald Owen, Patrick Stewart, Mr. Magoo, and even Rowan Atkinson (as Ebenezer Blackadder in one of the stranger twists on this story) all bring credit to the role of Ebenezer Scrooge, my favorite version of all time is the one made in 1984 featuring the incomparable George C. Scott as Scrooge. What makes this version really stand out is the somber gravitas that the cast bring to their respective roles. Lines we’ve heard dozens of times in the past take on a whole new intensity, and each character becomes more real and believable in the hands of this wonderful ensemble. George C. Scott was nominated for an Emmy in 1985 for this role. It is to his everlasting credit that rather than sleepwalking through this oft-portrayed role of Scrooge, he instead gave it a fresh interpretation that was, in my opinion, one of his finest performances ever. He wisely did not attempt a British accent, instead delivering his lines in that famous gravelly voice. His Scrooge is not merely a cranky old man (as he is so often portrayed), but a man who harbors a profound anger against the world. As he is visited in turn by each of the Three Spirits, we understand how this anger took root, grew, and ultimately strangled his soul. As he is forced to review his life, we see him alternately softening, and then relapsing again into unrepentant obstinacy. And in the great dramatic scene when he, kneeling and weeping at his own grave, begs for mercy as he attempts to convince the third spirit of his repentance and desire to alter his life, we see a man who has been utterly broken and brought to his knees literally and figuratively. Scott has made Scrooge utterly believable and painfully human. Even more magnificent is the performance given by the wonderful English actor Frank Finlay as Scrooge’s late partner, Jacob Marley. In most versions of this tale, the scene with Marley tends to be a bit of a low point in the film, simply because it’s difficult to portray a dead man convincingly, and the results are usually just plain silly (ooooh, look, it‘s a scary ghost…….not!) In this version, it is perhaps the most riveting scene in the whole movie. Marley’s entrance, as the locks on Scrooge’s door fly open of their own accord and the sound of chains rattling echo throughout the house, is wonderfully creepy. But Finlay’s Marley is no ethereal spirit. He is a tortured soul, inspiring both horror and pity. Marley may be a ghost, but his rage and regret over a life wasted on the pursuit of wealth, and his despair at his realization that his sins are now beyond redress, are still very human. As portrayed by Finlay, we have no problem believing that even the flinty Scrooge would be shaken by this nightmarish apparition. Finlay really steals the scene here, something not easy to do when you’re opposite George C. Scott. And it just goes on and on, one remarkable performance after another, making it seem like you’re experiencing this story for the first time. Edward Woodward (remember him from the Equalizer?) is by turns both jovial and menacing as the Ghost of Christmas Present. When he delivers the famous line, “it may well be that in the sight of Heaven you are more worthless and less fit to live than MILLIONS like this poor man’s child” he is no longer a jolly Santa Claus surrogate, but an avenging angel who gives Scrooge a much needed verbal spanking. Susannah York is a wonderfully tart tongued Mrs. Cratchit, and David Warner brings marvelous depth to the long suffering Bob Cratchit, a man who goes through life bearing the triple crosses of poverty, a sick child, and an insufferable boss. His face alternately shows his cheerful courage, and also, at times, his weariness, in the face of intolerable circumstances. Later, in the scene in which Scrooge is shown by the Ghost of Christmas Yet to Come the Cratchit family after the death of Tiny Tim, Warner’s performance, while hardly uttering a word, will move you to tears. One final note should be made about the musical device used in this movie to unite certain themes. Composer Nicolas Bicat uses a variation of the Wagnerian “leitmotif”, whereby a musical theme becomes associated with a certain character. Here Bicat uses two themes to unite groups of characters. The first, a plaintive theme consisting of two falling phrases, is first heard when Jacob Marley enters Scrooge’s room. This is particularly effective, for instead of the “scary” music one might expect to hear at the entrance of a ghost, what we hear instead is a sad, lonely theme played by a single cello. This unexpectedly tender music underscores the utter tragedy of Marley’s condition. This theme appears several times in the movie during scenes when Scrooge is forced to reflect on his life, uniting him with Marley, and undergoes a dramatic transformation at Scrooge’s graveside scene, where it becomes powerful and dramatic as it is blasted out by a full orchestra. Finally, in the scene where Scrooge “awakens” from his visit from the third spirit, this theme appears in a somewhat altered form, coming full circle as it is again played by the solo cello. Now it somehow sounds hopeful, and just as the theme has changed, we realize that Scrooge, too, has changed. The other leitmotif is heard whenever Fred or his mother Fan, Scrooges dead sister, are in the scene. It is a gently skipping theme which, while seemingly happy on the surface, still has a streak of sadness in it. We hear it in the background as Scrooge reminisces about his late sister, or muses over how much like her Fred looks. By uniting these characters it helps make Scrooge more human.